Computers have made our lives simple and very convenient by offering our needs at a click of a mouse through online shopping thereby saving a significant amount of our time to go to the local market and buy them. Thus if you wish enjoy the benefits of this incomparable system and wish to have a better hold in today’s modern technology then you need to have at least basic computer knowledge. HICES has been introducing training programmes to meet the challenges of computer revolution. HICES has developed a set of certificate courses each for long duration and short duration. The long term courses vary from duration of six months to three years and metamorphose a teenage student into a thorough bred polished computer professional. The special short term certificate courses vary from one week to twelve weeks duration and are specifically job oriented. HICES is breeding computer professionals right from the initial stages of a students career. 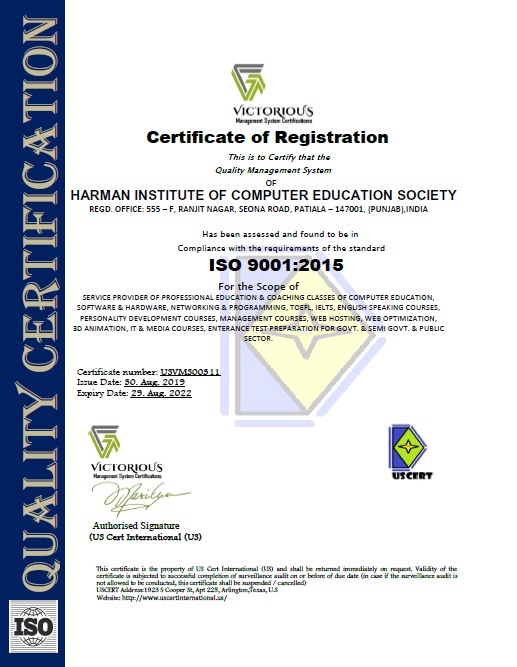 HICES (Harman Institute of Computer Education Society) offers a sound and friendly atmosphere for different students receiving intensive Coaching and Tutoring in a variety of subjects. Our school and college programs address the needs of those people who want to achieve complete mastery over their subjects. HICES deals in all the streams of education- INFORMATION TECHNOLOGY, COMMERCE & FASHION TECHNOLOGY. It has got a pool of well qualified professionals from different fields who work diligently in finding out various ways of helping its students in gaining good percentage of marks in their respective subjects. HICES makes students proficient in various technologies including HTML, CSS, Java, C, C#, XML, SQL, .Net, JSP, Linux, VB, Red Hat Linux, Oracle, Sun Java & others.